Portions of this review also appear in our coverage of the film's Ultra HD Blu-ray release. For its theatrical presentation, Lee had the movie shot at a high frame rate, 120 fps, which is somewhat recreated for the 60fps rate of the 4K Ultra HD version of this release, but not for the standard Blu-ray version. Lee's concept was to provide a very intimate, "realistic" image for the audience that would supposedly allow each viewer to feel like he or she was right there alongside Billy during the course of this movie. Additionally, most of the exchanges in the film are close-up shots of the actors either looking directly into the camera or slightly off it during their dialogue delivery. I didn't see this film in the theater (where the 120 fps also included 3D in many theaters; a 3D version is also available but only as part of the 4K release and without the high frame rate), but the effect doesn't work all that effectively at home. Sure, the 60fps image (assuming you go with the 4K disc) wows in its clarity, but also doesn't look very much like a movie...it feels more like an interactive video game at times. 'Billy Lynn's Long Halftime Walk' strolls onto home video in this Blu-ray/Digital HD combo pack. The 50GB disc is housed inside a keepcase along with an insert containing a code for a digital copy of the movie. The Blu-ray is front-loaded with trailers for Inferno, The Magnificent Seven, Passengers, Underworld: Blood Wars, and the animated 'Resident Evil: Vendetta'. 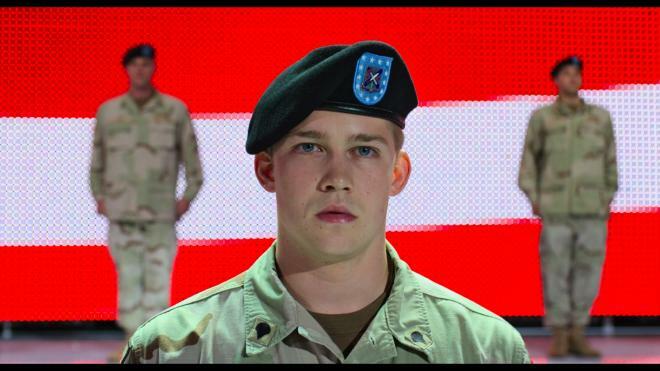 The main menu consists of a still photo of Billy Lynn in uniform leaning up against the wall, with his shadow showing the image of him in action as a solider. Menu selections are across the bottom of the screen. While there's nothing technically wrong with the video presentation here – aside from a bit of aliasing that exists in all of the available home video versions of this title – the image really pales in comparison to both the other versions that are available on the 4K Ultra HD release of this movie, which contains both a 4k/60fps rendering of the movie and a separate 1080p 3D version (why the 3D version isn't also part of this release is anyone's guess, aside from a ploy by the studio to get buyers to consider investing in 4K - odd, since many 4K sets these days don't even support 3D). Judging by what we do get though, the image is about what you'd expect in a high-def release, and since it's taken from a pretty good source (a 4K digital intermediate that's obviously downgraded to 1080p here), viewers who can only see this version of the movie due to their home theater setups should have no major complaints, although I feel it's probably important to emphasize that there's no real reason to see 'Billy Lynn's Long Halftime Walk' without the high frame rate experience. My opinion about the audio in this release – an English 5.1 DTS-HD Master Audio track – sort of mirrors my feelings about the video. 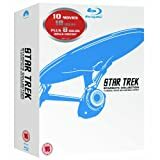 There's nothing technically wrong with what is provided with this lossless audio, but experiencing the Dolby Atmos track that is only available on the 4K Ultra HD release is a much better option, should it be available to you. With the above in mind, there were no apparent glitches in the track, but aside from the actual halftime show in the movie (which flashes back and forth between the performance and a firefight the main character was involved in and provides some fun aural activity), there's not a whole lot audio-wise happening during the movie. But that, of course, has to do with the source material and not any problems with the audio here, which is well-rendered. In addition to the 5.1 track, an English Descriptive Audio track is also available, as are subtitles in English, English SDH, and Spanish. 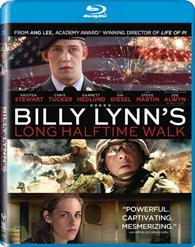 'Billy Lynn's Long Halftime Walk' seems very much like a situation where a talented director got so caught up in the visual process he was providing for his movie that he forgot to tell a really good story. This is also one of those rare situations where only the 4K Ultra HD release (which is the only release with both high frame rate and 3D versions) is worth bothering with. Consider this standard 2D Blu-ray safely skippable.